Description: The young inventor Nicolette Lampton is living her own fairy-tale happy ending. She's free of her horrible stepfamily, running a successful business, and is uninterested in marrying the handsome prince, Fin. 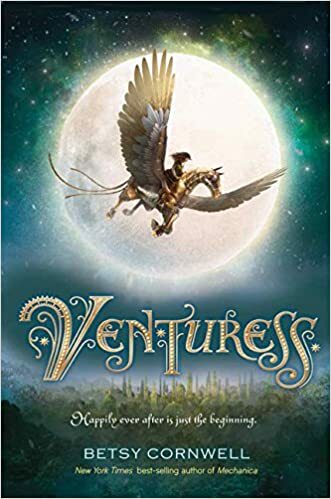 Instead, she, Fin, and their friend Caro venture to the lush land of Faerie, where they seek to put an end to the bloody war their kingdom is waging. Mechanical armies and dark magic await them as they uncover devastating secrets about the past and fight for a real, lasting happily-ever-after for two troubled countries—and for themselves. My Thoughts: This is the sequel to Mechanica. It tells what happens after a girl rescues herself from her evil stepfamily, finds her prince, and looks to her future. Nicolette Lampton has set up her own shop as an inventor and has declined the prince's offer of marriage. Oh, she loves Fin that isn't in doubt. But she also loves Caro who also loves Fin. Fin and Caro are family for the orphaned Nicollette. But trouble is brewing in Esting. Religious bigots who despise all things magic, unless they are the ones doing it, and all things Fey have been gaining influence with the citizens and with the king. They want to declare war on Faerie and exterminate all the Fey. Prince Fin is apposed to the idea but his voice is reason is being drowned out by the bigots. Nicolette is also opposed because she was raised by a half-Fey housekeeper that she loved. Her housekeeper Mr. Candery was forced to flee from Esting to Faerie when Nicolette was only twelve. Now, he sends her a letter asking her to come to Faerie and bring Fin in the hopes that some sort of peace treaty can be worked out. The letter arrives just after an assassination attempt on Fin comes way too close to success. So Nicolette, Fin and Caro embark on a journey to Faerie. The journey is exciting and ends with a magical storm which destroys their airship and leads to a ferocious battle waged by automatons representing each side. I loved the steampunk details in this book. Nicolette makes marvelous devices. Her most notable are the insects and horse that she has improved on but which were created by her mother before her death. The horse Jules had been her only friend and companion after her mother's death until she met Fin and Caro. Jules has been great support to her. The insects and Jules are both automatons but they gain their life force from something called the Ashes which her mother left for her to use. She doesn't know what they are or where they come from and hopes to find that answer when she goes to Faerie. Nicolette makes other discoveries when she gets to Faerie that rock her world and force her to make some crucial decisions. It is a time of growth for her and for Fin who becomes more confident in his role as the future king. I loved the Fey and the Mermen who were also residents of this world. Fans of adventure, steampunk, and fantasy will enjoy this reimagining of the Cinderella story and will love getting to know Nicolette. "I don't suppose you've spent a whole day mending seams?" "No, because then you'd know how tedious it is, and you'd know the value of a machine that does it for you. and it's a rare girl who doesn't have to do those things, you know -- spending her whole day mending and cleaning and boiling water, with not a moment to herself for a thought of her own..." I took a deep breath, pushing away the memories of my own forced labor. "It's all right if you do like those chores, but so many girls have to do them that they never get the chance to discover what they like, all for themselves. So I make helpmeets that give those girls time to find out. To do whatever the things are -- the girl things -- that they like to do." It was funny; I'd never quite thought about it that way, but I knew as soon as I said the words that they were true. I really enjoyed Mechanica. Didn’t know there was a sequel. I’ll have to put this on my list! Thanks.